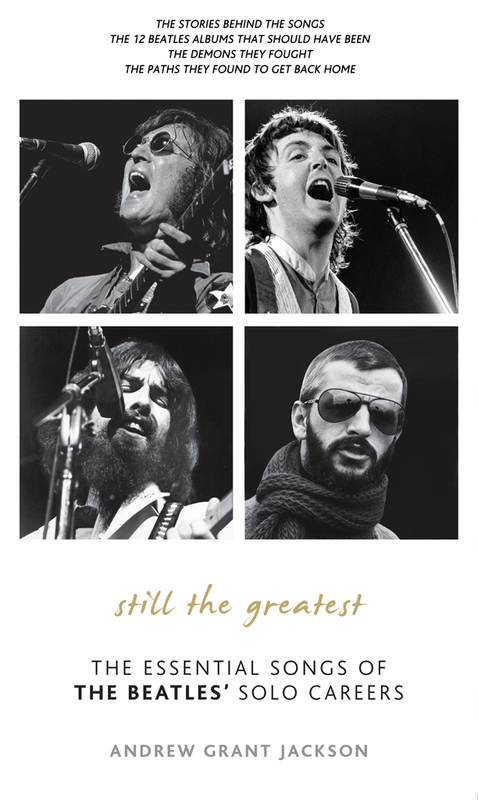 Recommended by USA Today and excerpted in Rolling Stone.com, the updated paperback version of Still the Greatest: The Essential Songs of the Beatles’ Solo Careers features a new 12-page Afterword. After the first printing, some readers said their favorite deep cuts had been left out, so the author asked 15 Beatle experts to talk about the tracks they felt should be added. The book celebrates the high points and often overlooked songwriting and recording achievements of John, Paul, George, and Ringo after each struck out on his own. CLICK HERE FOR “STILL THE GREATEST” ON AMAZON. Published by Scarecrow Press, a division of Rowman and Littlefield. In this creative history, the book investigates the explorations by each of new genres like reggae, funk, disco, and the 80s big drum progressive sound before the later return to their Beatle-esque roots. Lennon brought a new level of soul-searing honesty to the singer-songwriter tradition while McCartney filled the airwaves with lushly orchestrated rock operas. Harrison synthesized Indian music, gospel, and Southern blues, mixed them with Phil Spector’s Wall of Sound effects, and conquered the charts with hymns to the Lord while inventing the rock charity concert. Meanwhile, for a stretch, Ringo was second only to McCartney for the most consecutive Top 10 singles in the U.S. Still the Greatest profiles their collaborations with artists like Jeff Lynne, Elvis Costello, Phil Spector, Eric Clapton, Elton John, Joe Walsh, Nashville session masters, their old mentor George Martin, and Radiohead’s producer Nigel Godrich. We see George’s one-two comeback punch of Cloud Nine and the Traveling Wilburys, Ringo’s later albums of sixties-esque jangle pop married to words of hard-won wisdom, and McCartney’s third act resurgence comparable to Dylan’s as he turned to music again for catharsis, surprising those who had him pegged as a light pop craftsman. Andrew Grant Jackson is the author of the upcoming 1965: The Most Revolutionary Year in Music for St. Martin’s Press and Where’s Ringo? for Thunder Bay Press. He has written for Rolling Stone, Yahoo!, Slate’s “Blogging the Beatles,” Baseline Studio System, music magazines Burn Lounge, Mean Street, and Dispatch, and copyedited the Hollywood monthly magazine Ingenue. He directed and cowrote the feature film The Discontents starring Perry King and Amy Madigan and served as actor Jeff Bridges’s development associate at AsIs Productions. He lives in Los Angeles. Posted In: About the Book/ Get It Here! Well I just bought the book from Amazon. But I am worried it will be yet another disappointment, inflating the importance of John’s solo work and demeaning Paul’s solo work when I think Paul’s albums in the 70s are MUCH stronger than John’s. But I guess we’ll see if I regret my purchase. 🙂 My only dispute with the premise of this book is that each Beatle DID produce a great solo album. John’s masterpiece is Plastic Ono Band. George’s is, of course, All Things Must Pass. Ringo’s is “Ringo.” Paul’s masterpiece(s) are Ram, Band on the Run, and McCartney II. And I wouldn’t want to miss out on any of those albums. There’s also rumors going around about Paul releasing a new album in 2016; maybe it’ll have some really good songs?